The Food Alphabet and More: The Starbucks Card arriving soon! Turn you visits into Rewards! Starbucks Philippines is proud to present to us The Starbucks Card, the one you have been waiting for! 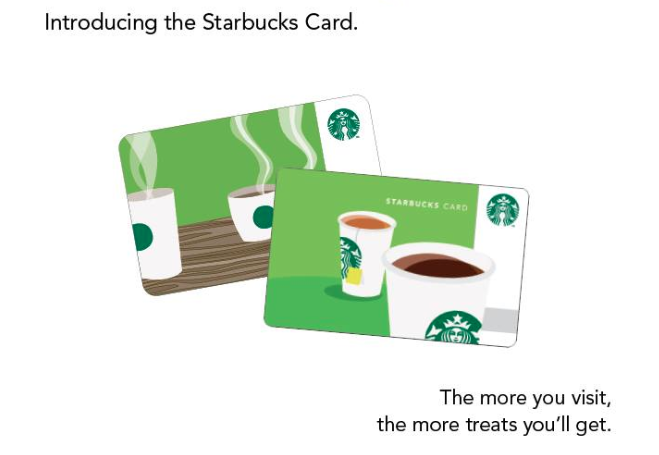 The Starbucks Card is a stored value card and also acts as a loyalty card wherein, as you use it more, the more rewards you earn in return. Come back on The Food Alphabet in the next few days for more updates, and for the official launch of The Starbucks Card, and learn everything you need to know about "The Starbucks Card"
Great news, would you want to be one of the first to own a Starbucks Card? Here is your chance. As stated, if you have purchased any Starbucks handcrafted beverage from July 31 - Aug. 7, 2013, keep your receipt. 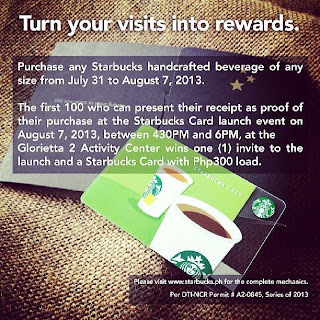 The first 100 who will present their receipt on the launch event on Aug. 7, 2013 from 4:30PM and 6PM at the Glorietta 2 Activity Center will win one (1) invite to the launch and with it a Starbucks Card with P300 load. So keep those receipts and rush on and be the first few to have The Starbucks Card.